George Vanderbilt came to Asheville to pursue a dream: to build a self-sustaining, working estate supported by agriculture. More than a century later, this interest in agriculture continues. Biltmore was a pioneer in sustainable land-use practices in 1895 and has long operated its farm and field-to-table program. Estate pastured beef and lamb, as well as eggs from chickens and quail are served in estate restaurants. Vegetables, herbs and fruit are grown in a production garden. 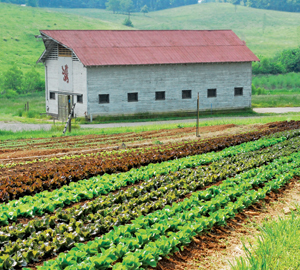 Partnerships with farmers in Western North Carolina also promote the use of locally-sourced food for estate restaurants. While it’s not visible to estate guests, the backbone of the field-to-table program is the estate’s production garden. Tucked away on the west side of the estate devoted to agriculture, this garden supplies estate restaurants with fresh herbs, seasonal fruits and berries, as well as a variety of vegetables. Biltmore chefs count on regular deliveries of the garden’s harvest. This means Biltmore guests have the unique pleasure of enjoying fresh, locally produced meals showcasing seasonal ingredients. An estate vineyard produces Chardonnay, Riesling, Viognier, Cabernet Franc, Cabernet Sauvignon and Merlot grapes -- varietals which thrive in Western North Carolina’s temperate climate. These grapes are used to produce Biltmore Winery’s award-winning wines under the guidance of winemakers Bernard Delille and Sharon Fenchak. 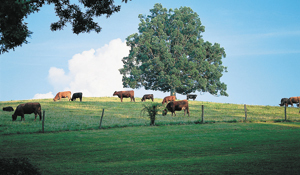 In Vanderbilt’s day, the estate’s rolling pastures provided beauty and a place for livestock to graze. Today, history repeats itself as Angus cattle and a flock of South African White Dorper Sheep roam fields. Biltmore prides itself on humanely raising the animals on lush pastures with natural grains and abstaining from growth hormones and antibiotics. A portion of the herd and flock is culled each year so estate restaurants can serve premium cuts of meat. 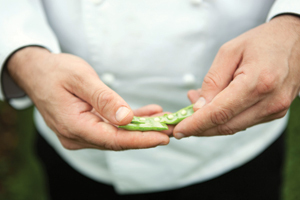 While Biltmore prides itself on serving estate-raised ingredients, sometimes demand exceeds production. In an effort to support the community and serve only the best, Biltmore works with community farmers and food producers to source local ingredients and meat. The estate’s “buy local” program supports the local economy, reduces the estate’s carbon footprint, and literally provides a taste of Western North Carolina to estate guests.